The group’s leader, Contramestre Frankenstein (Roberval Da Silva) was brought to Calgary in 2003 from Olinda Brazil! He has pioneered the path for Capoeiristas in Calgary and has been teaching a dedicated group of students ever since. Contramestre Frankenstein has taught and performed all over the world and for a volume of institutions in Calgary! Capoeira is many things to many people. Like most sports, it is a lifetime of dedication to some, but regardless of what it becomes for you, we believe it will be an important contribution to anything you pursue in the future! There is truthfully something for everyone and more! Capoeira is not just a Martial Art, it is an educational asset that demands and teaches its students to be disciplined, confident and well-rounded individuals at any stage in life. Capoeirista’s are known for their Elusive Nature and Powerhouse, yet Graceful Movements! You can learn to be all this and more through our weekly classes. 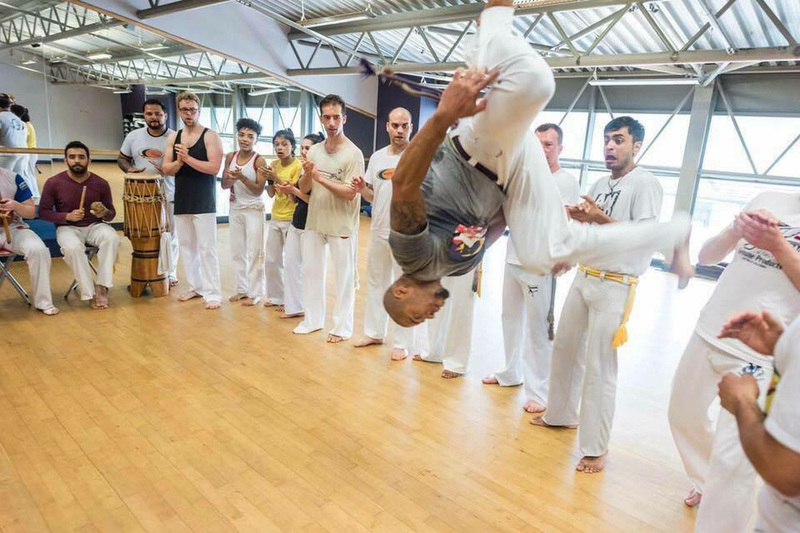 Each section includes a concentration on Capoeira Fundamentals, and with dedication and focus you can expect to benefit from the following and more! Learn new skills and push your limits! Capoeira Cajue follows the “Contemporânea” (contemporary) style of capoeira. Contemporânea is a term for groups that train multiple styles of capoeira simultaneously. 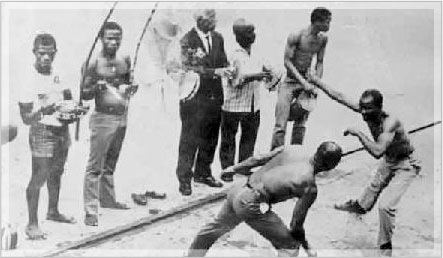 Very often students of Capoeira Contemporânea train elements of Regional and Angola as well as newer movements such as the emerging game of Benguela, that would not fall under either of those styles. This sub-style is seen by some as the natural evolution of Capoeira. Our founders, Contramestre Frankenstein in Calgary & Contramestre Sapo in Toronto, pride themselves on being held to the highest standard of Brazilian Arts and aims to provide the most authentic education and showcases. They both started Capoeira in Olinda Brazil as children and have been training and teaching ever since. Between the two of them, they have close to 50 years experience! All other teachers in Capoeira Cajue must have at least a decade of experience and actively train on a weekly basis. Contramestre Frankenstein remains responsible to his students by inviting guests from around the world; On an annual or semi-annual basis these guests are invited to teach workshops and perform in events to further the groups education and experience. Capoeira Cajue Calgary offers instruction in Capoeira (Ca-po-era), a form of martial art developed in Brazil over 400 years ago that combines self-defense with elements of brazilian culture, music, dance and acrobatics. 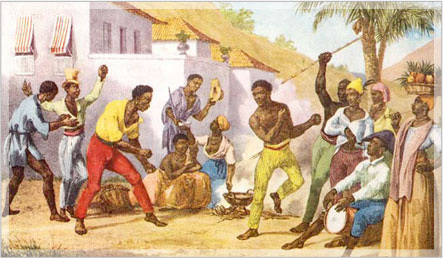 The emerging school of thought is that Capoeira developed in the streets of Brazil after the Abolition of 1888 by those who were once slaves. These East and West Africans and native Brazilians could not find work because they were illiterate and only possessed skills related to slavery, so they spent their days loitering on the streets. Love of music united these cultures and it was not long before the roots of Capoeira were planted. Music inspired dancing, comraderie inspired play, aggression inspired self-defense. Capoeira is more than a martial art. It is an art form that exercises the mind as well as the body. Capoeira encourages men to be graceful and fluid, and women to be strong, powerful and confident. As for the children, they are not taught the fighting aspects of Capoeira until they have matured and have developed a solid understanding of the cooperative game of call and response. Capoeira is the whole package – exercise for the mind, body and soul. To learn more about this unique and all-encompasing martial art, feel free to come by the studio to check out a class! Capoeira Cajue Calgary holds a Batizado each year for its students. A Batizado is an event over the course of a weekend, that includes several workshops from various guest Instructors, a ceremony where the students receive new belts and is usually concluded with a Brazilian Cultural show for family, friends and the public. Unique to Capoeira, it is standard practice that at a Students first Batizado, they are given an Apelido (nickname) when they are “baptized” into the group and receive their first belt. That name is generally what they are known as, as they continue Capoeira. The belt system is as shown below. Once a student reaches the Monitor belt, they usually have a decade of experience and are ready to teach beginner classes.